Handmaidens of the Lord focuses on the lives and ministry of Pentecostal women pastors and preachers in central Missouri. In devoting themselves to energetically serving their Lord, they often spend days and nights away from home ministering to their flock. How do they pursue this course in a church so fundamentalist that it decrees a woman's only place to be the home? In a religion that believes the Bible inerrant, Paul's admonition that women keep out of church business is taken very seriously. How then do the men and women in the churches view these women in authority? Elaine Lawless contends that it is the woman preacher's dedication to the sacred (as opposed to the secular) which provides her access to the pulpit. The preacher and her congregation firmly believe that her commission comes from God, and her task is not to overturn Pentecostal beliefs about home and family but to be both the epitome of good wife and mother and also the loyal servant of God. The congregation sees her as a mother figure, an image of nurturer that is compatible with Pentecostal beliefs about a woman's place. Lawless stresses that the women recognize, but perhaps could never articulate, that they walk a fine line between power and subservience. She concludes from hours of interviews and recordings that the woman pastor or preacher copes with this dichotomy by continuously re-scripting her life into a pattern acceptable to her community, because it is perceived by them, and by her, to be God's plan. The ""calling"" to serve becomes the central event in her life stories, and all her work revolves around it. 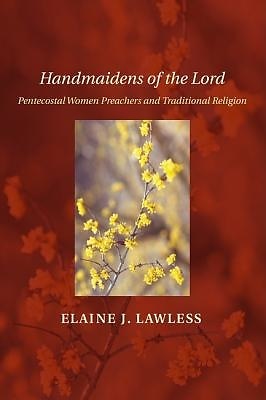 Handmaidens of the Lord includes life histories of four women preachers, transcriptions of sermons, and analyses by Lawless of both life stories and sermons. It will be valuable to scholars of religion, ethnography, folklore, and women's studies. Elaine Lawless is Curators' Distinguished Professor of English and Women's Studies and also serves as Adjunct Professor of Religious Studies at the University of Missouri, Columbia. She is also the current President of the American Folklore Society. Her works include Troubling Violence (with M. Heather Carver), God's Peculiar People, a study of Pentecostals in Indiana, and Holy Women, Wholly Women.